This is pretty much what I look like when I read the series. Another, more recent project idea I've had similar to the Keeper Necklace is the Shield Bracelet. If you've read my post about The Dresden Files series [Here] then you should know by now I'm a big fan. Probably one of the most iconic things Harry Dresden has in his arsenal of magical equipment is his shield bracelet. I've been sorta-kinda-not-really been working on a Harry Dresden costume. Still, I have wanted to make a shield bracelet. I'm not much into bracelets, but this I would wear, if I had it, and giggle to myself at the sheer awesomeness of it. Plus, it's super simple, right? Just get a chain, a couple of shields, and slap them all together. So then, why can't I find any shields? Looking for anything related to "jewelry" and "shield" pretty much comes up with a coating you put on your jewelry to shield it (go figure). Narrowing my search by adding "charm" or "pendant" or anything like that I tend to get shields that have pictures in them, or words, or Harley Davidson. Until I started my search I had no idea how hard it would be to find some plain, ordinary shield charms. Anything that I do find that comes close is often $50, which would work if I wanted one, but I want anywhere from five to eight of them, and that starts to really hurt. Sometimes, with projects like this, you have to keep them on the back burner until you find exactly what you're looking for. Out of all my projects it does really show what's so exciting about making jewelry. It's more than just slapping a dangley thing onto a chain and then running around with it on. It's about finding the perfect charm, putting it together with other perfect pieces, and seeing the hard work and intricate detail you've put into a piece come to fruition. 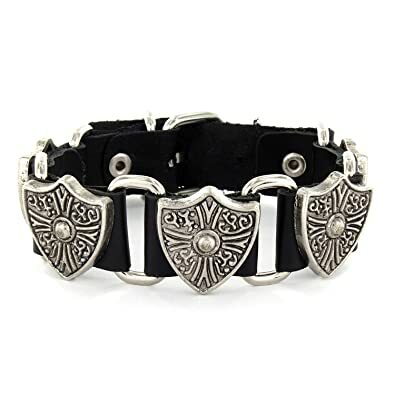 And really, hey, shield bracelets are awesome.